Everybody was excited to try out characters with more varied skill set than your average starting heroes. And we noticed that his kind of prelude let us (well… mainly the players) to fix the characters where there had gone wrong. I’m more than happy to allow this in a early stage of the game as it at least should make playing the characters more enjoyable. The “adventure” we had was not much. It was just as plain as “you’re travelling from one place to another when a band of greenskins attack you”. Personally I haven’t used greenskins actually ever in my games. I find them a bit too simple to be actually interesting as you can always guess the motivations and sources of beastmen and mutants. But I was happily surprised to find out that they were actually perfect for what they were designed – for fighting. I had two henchmen groups of goblins shooting arrows from an outcrop, four orcs attacking the characters (well two of them kept beating a dwarf slayer that I stole from the dwarf supplement one-sheet) and a black orc leader. The battle was more interesting than any of us had anticipated mainly because I combined two location cards: steep river running next a rocky outcrop. 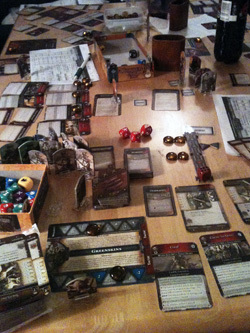 The fight started with Kurt missing with his pistol shot and Rothirsch challenging the black orc into a duel. The black orc made instant game session history. It called out a WAAAGH (using Greenskin sheet from GM’s Toolkit) and charging towards Rothirsch killing goblins on its way. With a mighty blow it almost struck the duelist down (leaving him with only two wounds) but managed to roll two chaos stars! Now I don’t remember that the particular actions said about chaos stars but the location card told it would cause the fighter to fall into the river! So gone was the might boss with a one nearly insta-kill strike! The rest of the battle was pretty much your basic fighting but Sayr managed to shine. He was convinced he could confuse the goblins with his winning smile and even though I added four difficulty and three misfortune dices into his dice pool he came out winning! He threw the goblins a smile that made them to hold their attack (well the other group of henchmen goblins at least) and started to climb towards them. When he reached the goblins one of the henchmen groups tried to swarm him but only managed to cause a few bite marks on his calf. Sayr was quickly up again and again against nearly impossible odds managed to convince the goblins to run away! So the characters had successfully averted a large greenskin attack almost without a scratch only to find an immensely pissed off troll slayer calling them by foul names for interrupting his quest for glorius death. Thus ended our prelude session (which run only little over one hour) and I think we will be having a lot more fun when adventuring in the Grey Mountains!